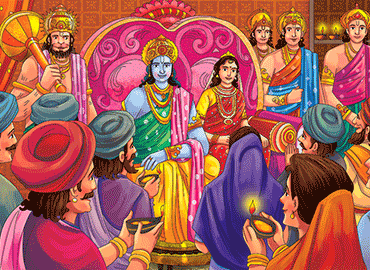 By a strange set of circumstances the five Pandavas were all married to the same wife. Her name was Draupadi, and she was beautiful, clever and spirited. She was devoted to her five husbands and they loved her deeply in return. The royal Pandavas valued her intelligent advice, and she managed their household to perfection, ruling wisely over a large retinue of servants, ministers and other household staff. But when our story opens, the sly Kauravas had tricked the Pandavas out of their inheritance. The Pandavas were now living with Draupadi, and all their household followers, in exile in a dark forest. Draupadi continued to look after everything and everyone, even in the sinister and dangerous jungle. One day, Surya, the Sun God came down from Heaven and paid a visit to the Pandavas. Prince Yudhishthira, the eldest of the Pandavas and their leader, approached Lord Surya with his head bowed and his hands pressed together in a respectful greeting. Lord Surya smiled and greeted Yudhishthira. With these words, he held out a simple wooden bowl. It was plain, with no ornaments or carvings or decoration. It was a bowl that one might see a poor farmer using, to carry food for his family. But, Yudhishthira knew better than to question this gift, coming as it did from the very hands of the Sun God himself! “I thank you with all my heart, My Lord,” said Yudhishthira. The Sun God then explained: “This plain wooden bowl is, in fact, the marvellous Bowl of Plenty. The Gods in Heaven have been pleased to offer it to your wife, Saintly Draupadi, to enable her to fulfil her demanding responsibilities. When Surya had finished speaking, he handed the bowl to Yudhishthira and vanished, leaving a shower of glittering, golden sparks, which winked out as they slowly settled on the ground. Yudhishthira, in turn, gave the wooden bowl to Draupadi, who used it from that day, to feed everyone living in the dark jungle with the Pandavas. At the same time, there was a sage named Durvasa, who had a thousand devoted followers. He used to roam about the land followed by his thousand disciples, visiting the palaces of the great Kings and Queens of the land. Each royal host would rush to satisfy his every need, because Sage Durvasa was famous for his short temper. If he grew angry, he hurled curses at his negligent host or hostess. Everyone, even the greatest Kings and Queens, shook with fear when Sage Durvasa and his one thousand disciples were heading for their palace. Food and stores and bedding and firewood aplenty were brought in. Servants were given detailed instructions, windows were cleaned, carpets beaten, floors polished, and all the brass and silver brought to a mirror shine, for woe betide any inattentive King or Queen. One day, Durvasa with his thousand disciples, came to Hastinapura, the great city where evil Prince Duryodhana, the Chief of the Kauravas, had his court. The wicked Duryodhana worked hard to serve the holy man faithfully, attending to his every need. He even served the food with his own hands, and made sure all the other members of the court, and all the servants of the palace, jumped to the holy man’s every desire. There were beds, and wood for sacrificial fires, and shady trees, where Sage Durvasa and his one thousand disciples could rest during the heat of the day. After a stay of many weeks, Durvasa was very pleased with Prince Duryodhana. The crafty Prince Duryodhana had been waiting for this moment. He loathed the Pandavas with black hatred. He feared them with unquenchable terror. He was envious of them with green jealousy. Now, he hatched an evil plan to destroy them. He bowed low to Sage Durvasa, and hid his dark intentions behind the innocent expression on his face. “Oh Great Sage! You are indeed the greatest of living holy men. Your visit to my humble dwelling with your thousand followers was gift enough!” said the deceitful Duryodhana. Durvasa was flattered, and insisted that Duryodhana ask for a gift. Here Duryodhana was especially clever and cruel. Duryodhana knew of Draupadi’s magic bowl. He would grind his teeth in rage at the idea of the Pandavas having this divine object. He knew of its special power to feed everyone, until Draupadi had eaten. He knew that it would remain empty until the next day. Now, he meant to use the magic of the bowl against the Pandavas! Sage Durvasa was delighted with this suggestion, and agreed to set off with his thousand disciples to visit the Pandavas in their forest dwelling. He agreed that it would be good to time his arrival after Draupadi had finished her evening meal. Duryodhana could not have been more thrilled. When Draupadi finished her meal the magic bowl would remain empty until the next day. There would be no food for the holy man and his followers. Sage Durvasa would feel insulted at the lack of hospitality, he would become enraged, and deliver a mighty curse on the Pandavas. Durvasa and his host of followers, immediately departed from Hastinapura. They walked for days. Finally, he and his devotees approached the jungle encampment of the Pandavas, just as Draupadi took the last mouthful of her evening meal, and the magic bowl emptied itself for the night. The Pandavas and Draupadi heard a quiet rustling coming from the jungle path. It was the sound of approaching footsteps. They looked up from their empty plates. Who could it be coming to their camp so late at night? Was it a stealthy enemy, preparing for a surprise attack? Was it a band of lost travellers seeking rest, and directions out of the dense jungle? Was it some friend, coming to comfort the Pandavas in their forest banishment? They waited, listening, as the sound of many footsteps grew gradually louder. They readied themselves. They had weapons close at hand for an enemy; and a cheerful greeting for a friend. But they did not have any food, and Draupadi and her five husbands were concerned. No matter who was coming, they would not be able to offer them a meal. All their worst fears were realised, when they saw the holy sage Durvasa striding around the final bend in the jungle path. And, he was followed by his one thousand disciples! They all knew of Sage Durvasa’s short temper and demanding ways. All of them knew that he would curse them if they were unable to satisfy his every desire. And, they had no food to offer these guests, who had walked the long weary path through the jungle to their humble encampment.